4.1 out of 5 based on 117 bloggers and 86 commenters. 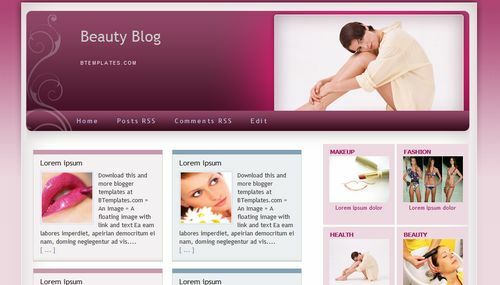 Beauty Blog is a free blogger template with 4 columns, right sidebar, fresh look, posts thumbnails and girly looking. I have a big problem: I added 2 “new pages” to my blog, but they do not open in full, even when I click on them. How can I do so I can see them in full when I access the page? hi Alina, i tried it out it doesn’t allow to view the full page. I would suggest just add an html post and link that manually. Mahmood, thank you for the answer, I will take in consideration your suggestion. I’ve seen on the site you gave me as an example that it has a very nice navigation bar. How did you do it? Hi Alina… you will have to add a css to your code and modify the html for this code to show up….. contact me through email and i CAN help you set it up. since i cant post the code here. i already download the templates.why i can’t open the xml??? when i open it will pop out error. But when i apply it, the blog page only show the ppink background, the white background/ red background and the girl pict. did not show up. Anythings wrong with the code??? Jaslynn, I have the same problem, I’ve been using this template for months now, and this never happened. Not only the picture disappeared but the colours and horizontal menu colours, too! In the folder I found “outer-top” which i simply copied as a photo in the header and it worked. Hola, me gusto mucho este template, pero cuando lo instale, es otro totalmente diferente, que nada que ver con este. Ojala me puedan ayudar y poner el correcto. Saludos y gracias! I love this template and have added and customised it for my blog. It works really well for the type of bog I have. I wanted one that you had to click for posts rather than it showing the whole post on the front page which this one does. Firstly on the summery of posts it displays the title, thumbnail and some of the content. I would like to make the thumbnail clickable so that it will take you into the full post like the title does. Is there a way to do this. I found this bit of code below in the template which I think is to do with it, but I’m not sure how to edit it to make it work. Also is there a way to make the title fit into the box as longer titles instead of going to the next line just get cut off. soon after this you will find […] simply change it to Read more or [Read More] or whatever you prefer. hi joe the comment didn’t take the code reference so im putting it in quotations referring to open and close brackets. or simply search for [ … ] in the edit html and replace it with what you want it to say. HI! I tried downloading the template but when i uploaded in my blog, it is showing the other beauty blog template.. Can you give me the correct file for this template. Thank you appreciated.. There a problem when using this template when creat a new page (not the post). The Page content show in thumbnail style. How can I show page content as manual? Hi, I’ve been already download this template. But, when I preview it in my blog, it doesn’t like the demo in this site. How? It´s worng. WHen you download, another template is in!!!! !And, there´s no way to have the 4 boxes !!! I tried to download this template ( 5 times ). but i can’t..
@Catrin Hughes: Click on the download button above. If id does not work, try to download it with a different browser. Hi, maybe someone can help me. I just added this template to my blog and it looks great despite a few problems. One is I added an about page to my blog and this layout wont let the user click the post to read it. It’s really annoying, I don’t know of anyway to fix this. I would appreciate any help please!!! This template is amazing.. i love it so much. But can I change the girl picture with my picture..? I do need ur help. Olá! Eu amei esse template. Como posso mudar a imagem do cabeçalho? awesome template..hats off to the designer.. I want to use this beautiful template, is perfect for what I need but when I download nothing come. Can u please send me the HTML? Thanks a lot!! I absolutely luv this template but prefer a two column blog. I’m not tech savvy at all and want to know if this template can be converted to a two column instead of a four column.